Ann Bagwell was born circa 1708. She was the daughter of Thomas Bagwell II and Elizabeth Eyre. Comfort Bagwell was born circa 1710. She was the daughter of Thomas Bagwell II and Elizabeth Eyre. Sarah Bagwell was born circa 1712. She was the daughter of Thomas Bagwell II and Elizabeth Eyre. [S960] Lieut Edmund Robinson Bagwell Grave Stone, Find a Grave, www.findagrave.com. Lieutenant Edmund Robinson Bagwell was born on 2 June 1839 in Accomack County, Virginia.1 He was the son of Thomas Poulson Bagwell and Sarah Hamilton Wise.1 Lieutenant Edmund Robinson Bagwell married Margaret Douglas after 1845. Circa 1859, he graduated from William and Mary and he returned to Onancock, Virginia and opened a school.1 On 10 March 1862, he enlisted on as a private as one of the "Eastern Shore Refugees", organized as a company in Norfolk, Virginia, on February 5, 1862, by Captain John H. White. The company consisted of nearly 80 men, many of whom had served in the the 39th Virginia Volunteer Infantry. The "Refugees" took their name from the fact that the Eastern Shore (Accomack & Northampton Counties in Virginia) had been taken over by Union troops so that the Eastern Shore of Maryland and Virginia should not secede. Anyone who wanted to fight for Virginia had to enlist on the western shore. The "Refugees" served under various unit designations. Edmund was "elected" a 2nd Lieutenant on July 24, 1862. Of 139 men who had served in this unit, only nine were present at Lee's surrender at Appomattox Court House on April 9, 1865 and 2nd Lt. Edmund R. Bagwell was one of them. There is a question as to when he attained the rank of General that is listed on the monument since he was only a Lt at the end of the war. There was speculation that he might have been made a general in the Virginia Militia. But there was no Virginia Militia after the Civil War. There were the Virginia Volunteers from 1871-1920 which became the Virginia National Guard was also known unofficially as the Virginia Militia but Lt. Bagwell was not a General of the Virginia Volunteers. Margaret Douglas married Lieutenant Edmund Robinson Bagwell, son of Thomas Poulson Bagwell and Sarah Hamilton Wise, after 1845. As of after 1845,her married name was Bagwell. Margaret Douglas was born in 1846. She died in 1916. She was buried at Mount Holly Cemetery, Onancock, Accomack County, Virginia. William Bagwell is the son of William Gray Bagwell and Aurora Vivian Watson. Grey Bagwell is the son of William Gray Bagwell and Aurora Vivian Watson. [S972] Margaret Bagwell Grave Stone, Find a Grave, www.findagrave.com. Harriett Bagwell was born on 28 November 1836 in Honea Path, Anderson County, South Carolina.1 She was the daughter of Joseph Ellis Bagwell and Margaret Nixon.1 Harriett Bagwell married John Jasper Ridgeway on 15 February 1854. As of 15 February 1854,her married name was Ridgeway. Harriett Bagwell died on 3 July 1921 in Greenville, Greenville County, South Carolina, at age 84. John Jasper Ridgeway was born on 24 October 1830 in Greenville, Greenville County, South Carolina. He married Harriett Bagwell, daughter of Joseph Ellis Bagwell and Margaret Nixon, on 15 February 1854. John Jasper Ridgeway died on 18 January 1904 in Greenville, Greenville County, South Carolina, at age 73. Burrell Bagwell was born circa 1840 in Greenville, Greenville County, South Carolina.1 He was the son of Joseph Ellis Bagwell and Margaret Nixon.1 He served in Company E, 16th Regiment, South Carolina Infantry (Greenville Regiment) of the Confederate Army. Emily Bagwell was born circa 1841 in Greenville, Greenville County, South Carolina.1 She was the daughter of Joseph Ellis Bagwell and Margaret Nixon.1 Emily Bagwell married Benjamin Gunnels.1 Her married name was Gunnels. [S962] J A Bagwell Grave Stone, Find a Grave, www.findagrave.com. [S1792] James Fred Bagwell Grave Stone, Find a Grave, www.findagrave.com. [S963] Ann Bagwell Grave Stone, Find a Grave, www.findagrave.com. [S966] James Louis Bagwell Grave Stone, Find a Grave, www.findagrave.com. 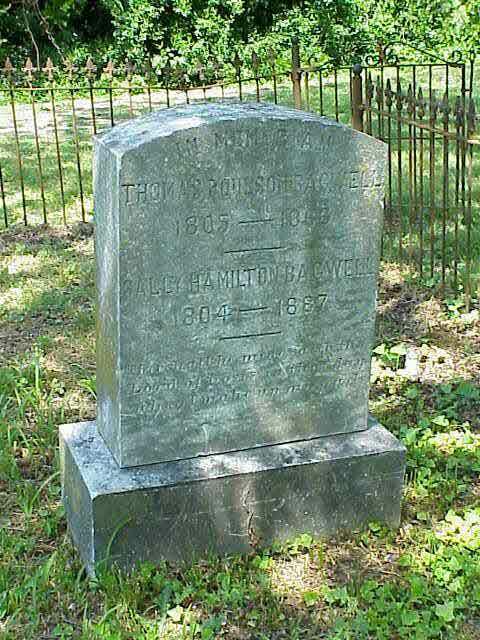 [S967] Emily C Thompson Bagwell Grave Stone, Find a Grave, www.findagrave.com. [S965] Lou E Bagwell Grave Stone, Find a Grave, www.findagrave.com. Clarence Melvin Bagwell was also known as Clarence Maner Bagwell. He was born on 19 March 1909 in Iva, South Carolina.1 He was the son of Burrell Lafayette Bagwell and Lou Ella Hicks. 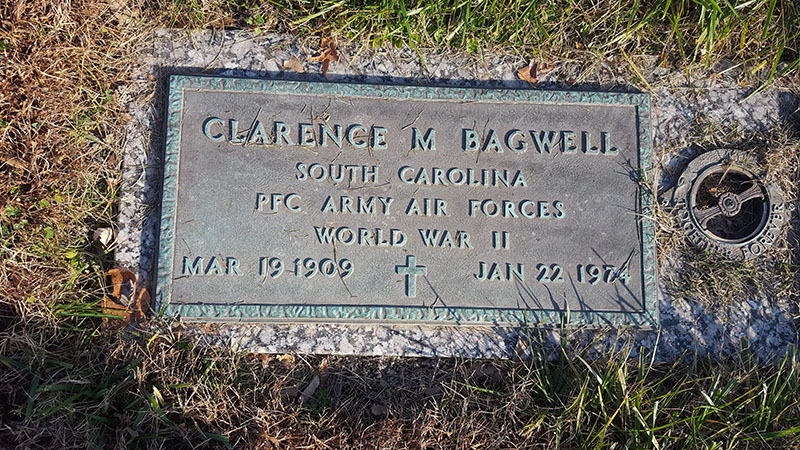 Clarence Melvin Bagwell married Levonia Louise Bateman on 4 April 1937 at Camden, North Carolina.2 He was listed as a soldier in the 1930 US Census stationed at Schofield Barracks, Honolulu, Hawaii Territory, USA. He was a PFC Army Air Forces during World War II. Marvin Henry Bagwell was born on 15 November 1907 in South Carolina. He was the son of Burrell Lafayette Bagwell and Lou Ella Hicks. Marvin Henry Bagwell married Lucille Davis after 1920. Marvin Henry Bagwell died on 26 April 1976 in Lincoln County, Georgia, at age 68. [S1789] Sr. Grover Cleveland Bagwell Grave Stone, Find a Grave, www.findagrave.com. [S1790] Maggie Culbertson Bagwell Grave Stone, Find a Grave, www.findagrave.com. [S2207] Jr Burrell L. Bagwell Grave Stone, Find a Grave, www.findagrave.com. Nellie Kinard married Burrell Lafayette Bagwell Jr., son of Burrell Lafayette Bagwell and Lou Ella Hicks.